The built environment is a central subject in fine art photography, especially in the conceptual documentary genre. Bernd and Hilla Becher have been a strong influence for the dead-pan observational style, recognised in the works by the Düsseldorf School photographers. Hilla Becher (1934-2015) sadly passed away October 10, but the legacy created through a 50 years collaboration with her husband lives on – as witnessed also at Frieze London. The best-known of the Becher School photographers is probably Andreas Gursky, whose pictures are printed on an epic scale and represented by the White Cube gallery in London. At Frieze, Bangkok IX , from 2011, was the same scale (307 x 221 cm) as his previous work, but a more abstract approach: “Here the line between photography and painting gets increasingly blurred – it’s impressionistic” as Diego suggested. There was also Thomas Struth’s famous picture of the Cologne Cathedral interior, showing the abstract stained-glass window by Gerhard Richter, exhibited at the Münich gallery Rüdiger Schöttle’s stand. Richter has been another mentor for Struth in the Düsseldorf Art Academy, alongside the Bechers. Equally monumental, we liked JR’s Ballet at the Galerie Perrotin booth. By placing a delicate female figure against the tower block, Diego sensed JR was questioning “ the creative potential against the modernist premise” with the juxtaposition in this large-scale print. Smaller though than the giant ones JR pastes over buildings and urban sites, what the artist/activist has become famous for, but impressive. Another evocative print – made from a found slide from 1969 – Sea of Galilee was a beautifully recycled view by Israeli artist Sharon Ya’ari, pregnant with political meaning, at the stand of Tel Aviv gallery Sommer Contemporary. Diego was already familiar with Ya’ari’s work and rates him as “one of the great contemporary photographers observing the history of Israel in a serene manner”. Wolfgang Tillmans’ work looks at the private side, exploring incidents of individuality and irrationality. At Maureen Paley’s stand we found an LA cityscape by Tillmans, again a personal, subjective viewpoint, highlighting the urban structure, where the car is such a fundamental element as well as a personal space within the city. At Stevenson gallery Guy Tillim’s dyptych provided a similar viewpoint, freezing a moment from Johannesburg, extended over two panels. At the Focus section, reserved for younger galleries, we discovered a solo show of Amie Siegel’s film and photographic works at Simon Preston’s booth, an interesting formal and conceptual exploration into architecture. Using the modernist icon Villa Savoie and its black copy in Adelaide, Australia as motifs, her work could be read as a reversal of the utopia of modernism, as Diego pointed out. Experimenter gallery from Kolkata, also at Focus, had dedicated their stand to Praneet Soi’s work (main photo), an Amsterdam-based multidisciplinary artist, who explored patterns and forms in South Asian culture. 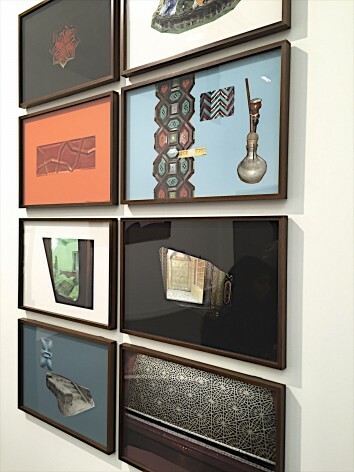 This included a series of photographic collages, looking at the ancient architecture of the Sufi shrines. Soi is a versatile artist who studied painting and now works with a range of media. It’s great seeing contributions from Asian artists, as Diego pointed out, which shows a different perspective into what design and architecture can be. Pioneering works from 20th century artists, like László Moholy-Nagy, all shot on film, were on show at Frieze Masters. Moholy-Nagy’s constructivist-style composition Marseille, Rue Canebière, a gelatin silver print from 1929 at Edwynn Houk Gallery, exemplified the revolutionary Bauhaus aesthetic of seeing and composing space. Alongside Ed Ruscha’s Gasoline Station Portfolio series from 1962, for sale at Bruce Silverstein’s booth, these photographs are key works in the canon of 20th century photography. Moholy-Nagy’s approach is not just about formalism: “In this photograph he gives an interiority to the view that extends to the public space, the pattern acts like veil, emphasizing the separation” Diego pointed out. Ed Ruscha’s rigorous project of documenting the LA vernacular building types could be seen as the forerunner of the Becher school. Ruscha had been admiring petrol stations as a child and had wanted to build miniature models of them. He ended up doing the photographic documentation instead, although in the contemporary context artists are building spatial models in order to then photograph them, as Thomas Demand, one of the Becher disciples, does. Exploring Frieze Masters you could see how photography has influenced the way we understand and evaluate space – and the continuous circulation of ideas. Moholy-Nagy rejected the idea of space as enclosure, which today is almost a given.